I was a writer long before I started cooking, but the more I developed a passion for being in the kitchen, the more I noticed similarities between these two mediums, or art forms, to pull from the title of today's poem. At their core, cooking and writing both begin with ingredients. For cooking, rice, clams, stock. For writing, a character, a pen, an urge. Next, action is required. Rice is stirred, clams are steamed, stock is simmered. Words are placed one after the other, sentences are formed, thoughts completed. The plate is garnished with parsley. The page is finished with periods. Both efforts create something from nothing. In this poem, Sally Ashton recalls a writer's residency. These experiences can often be immersive. Writers may spend the majority of the day toiling on their projects, finally taking a well-deserved break for dinner to stretch their legs and their mind, and to enjoy a good meal. During dinner service one evening, Sally watched the chef set out the day's offerings, then composed a poem likening the chef's movements to her own. flame what appetite to press in upon. Sally Ashton is Editor-in-Chief of DMQ Review. She is the author of three poetry collections, These Metallic Days, Her Name Is Juanita, and most recently Some Odd Afternoon. She teaches at San Jose State University. When I asked Sally about food memories from her residency, she rattled off a few dishes like grilled pizza, clams, and whole mackerel. The food was very fresh, seasonal, and just what writers needed to feel nourished after a long day of writing. The clams intrigued me. Elegant when nestled between creamy grains of rice, clams offer an elegance, but are part of a meal that's utterly comforting. Whether fresh produce or word choices, the idea that both chefs and writers question what to leave in or out is a bond we share. It's a question we will never cease to answer. The not knowing, and the promise of clarity and understanding (or at least a glimpse of it that might reveal itself through our work) might be just the push we need to keep at our craft day after day. The amount of stock you'll need will be dependent on the clams. After they cook, reserve their juice. (My pound of clams gave off about 1/4 to 1/2 cup of juice.) In total, you'll want between 4-5 cups of liquid. If you can spring for it, 2 pounds of clams would be even better! Heat a tablespoon of olive oil over medium heat and add the clams. Cook, partially covered, for 3 to 5 minutes, or until the clams open. You'll hear when they're ready; the clams will burst and their shells will arc back as if they're releasing into a long stretch. When all the clams have opened, turn off the heat. 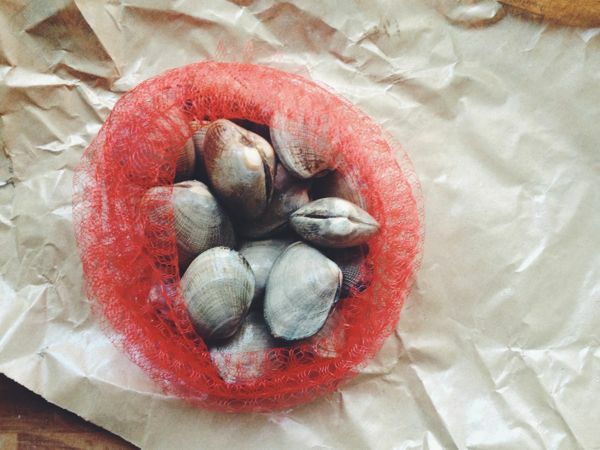 Remove the meat from each clam and place it into a bowl; reserve the shells. Add as much vegetable stock to the pan as you need to reach 5 cups; add the shells back to the stock and simmer. Heat 2 tablespoons of oil in a deep, heavy sauté pan over medium heat. Add the shallot and cook for 2-3 minutes, until translucent; do not let them brown. Stir in the rice and toast for 2-3 minutes. Pour in the wine and let it simmer until the liquid is absorbed, and continue scraping the pan so that the rice doesn’t stick. Season the rice and add a pinch of salt, then begin adding stock a ladle at a time, stirring often, and allowing most of the liquid to be absorbed before adding more. The rice is cooked once the grains are al dente, fully cooked but with a soft bite on the inside. Turn off the heat and vigorously beat in the butter and cheese with a wooden spoon to help it emulsify with the rice. Really shake the pan back and forth with one hand while stirring with the other. Continue stirring with abandon until all the ingredients have been incorporated. Serve immediately, garnished with additional Parmesan cheese and parsley.